It is misinformation to say that Mozart was buried in a pauper’s grave. This scenes from Peter Schaffer’s film Amadeus, where Mozart is chucked unceremoniously into a huge grave of dead compatriots in the middle of a great storm? Licence. The weather was quite nice, examination of history records reveals. And everyone in Vienna had ten years to decompose. Regulations. That’s the way it was at St Marx Cemetery, just outside Vienna. Aristocracy got out of it, with that slippery knack they have, but everyone else had a decade to do the dirty before they were exhumed and some accounts say that in 1801, they ejected Mozart from his resting place and took his skull off for some serious analysis. The academic analysis papers exist as testament to the clinical Austrian business of death. But it’s good not to be sentimental about these things, don’t you find? Eco-warriors choose to be buried in all manner of materials: wicker baskets, sustainable forest, eco ply and even cardboard. The builders are getting there, here. A stroll round the garden is to pick your way between the ceramic toilets and basins, and piles of old cladding. I have given up hope on my courgettes, which cannot seem to impress size-wise and keep churning out pinky-finger produce. I forget why we were standing in the garden last night. Felix and I were talking about something, yammering on, when he stopped mid sentence and his eyes nearly popped out of his head. “Whoa!” he exclaimed, vocabulary tiptoeing out of the back gate, trying to evade notice. For there, stretched out across the paving stones, was a cardboard box. And not any cardboard box. Probably six foot long and a foot or so wide, it beckoned Felix like a bone beckons the dog. It had held a long thin cupboard, I suppose, or some such thing. Within seconds he was inside. And did he make it into a Venetian gondola, with that vast childhood imagination of his? A bobsleigh? A canoe? No. He closed down the lid and lay inside, delight radiating from every cardboard flap. I paused a moment. The birds sang, the wind rustled lightly in the trees, cats strolled nonchalantly past the back gate. Was I comfortable with this line of play, I asked myself? It took less than a minute for Maddie to determine the fact that there, in the garden, was a perfect replica of a cardboard coffin. The magnetic attraction of the new arrival worked its wondrous magic, and the 12-year-old in the sophisticated brocade dress could think of nothing but the coffin in the garden. And as she mentally bolted herself in and shot a dramatic hand out of the closed box, the dog pottered out to investigate this new line of play. He sniffed the box with something like relish. I sighed, turned my back, and walked away into the house, leaving them to their gleeful, gaunt ghastliness. Eco-coffins have more than one use, it would seem. Posted in Shrewsday MansionsTagged cardboard coffins, coffins, eco funerals, kids, Mozart, playBookmark the permalink. getting into the spirit, I do hope you did ghostly stuff later? Excellent. I see the cardboard box retains its position as the premium toy! Quite, though when I was young we made cars and houses. Coffins, not so much. I still play with cardboard boxes. They have endless possibilities. I hope Macaulay didn’t express his relish in the usual manner…. Jan, he tried. But the children are well up to his antics and stopped him before he got to the critical 45 degrees. 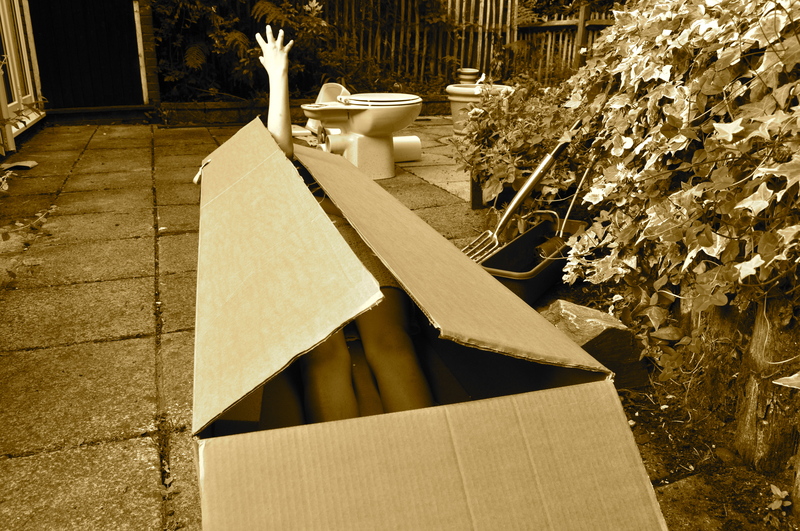 Where would the world be without a cardboard box to play in? What indeed? I should pour a glass of vino and mosey on up there myself for a spot of vampire role play. I must get the felt tipped pens out, Col. Clearly, you know kids very well indeed. Wondering if Macauley marked his territory? He tried: he was intercepted prior to any damage being done. It was a comedy moment, Tandy. It’s a cardboard box for me, once my organs have been whipped out. I wanted to donate my body to science but science just laughed at me. Pah! We don’t need science. Join me in donating my body to pseudoscience, they’ll have anybody. Kids and boxes. Some things never change. These eco coffins are all the rage at the moment. Seemingly they are not only environmentally friendly but welcoming in general. Personally I would prefer a mausoleum if financial circumstances allow. An excellent photo! The photo makes me think of vampires…just can’t quite reconcile Dark Shadows with the toiled in the background! 🙂 I’d have had to walk away, too, I think! Yes the toy of choice in most houses…… A huge cardboard box! In due time, that cardboard box might become a spaceship, a closet holding select merchandise … or the final resting place for one of your house’s spirits. Hours of enjoyment, as my son-in-law would say. What imaginations the kids have, Kate. We once lugged a refrigerator box home, the girls and I, wherein they set up housekeeping – until it rained. Not sure what I would have done had they made it a coffin.